The United Nations Security Council will hold an urgent meeting to discuss violence churning through western Myanmar, after the U.N.'s rights chief warned that "ethnic cleansing" appeared to have driven over 300,000 Rohingya Muslims from the country. Violence broke out in the Rakhine state after security forces launched an operation against Rohingya Muslims, forcing nearly 313,000, including women and children to flee and seek refuge in neighboring Bangladesh since Aug. 25, when clashes began. Exhausted Rohingya refugees have told stories of running from soldiers and Buddhist mobs who burned their villages to the ground and killed civilians indiscriminately, while the government blames militants for the arson. International pressure tightened on Myanmar's government Monday, as U.N. rights chief Zeid Ra'ad Al Hussein said the violence seemed to be a "textbook example of ethnic cleansing." Hours after the warning, the Security Council announced it would meet Wednesday to discuss the crisis, which has heaped global opprobrium on Myanmar's civilian leader Aung San Suu Kyi. A Nobel peace laureate, Suu Kyi is the focal point of anger from rights groups and a stream of fellow Nobel laureates for her failure to speak up for the Rohingya minority, who are denied citizenship and have suffered years of persecution in Buddhist-majority Myanmar. Late Monday the Ministry of Foreign Affairs, which she heads, said Myanmar "welcomes the statements issued by the United Nations and a number of countries firmly condemning the terrorist attacks," without referencing the U.N.'s charge of ethnic cleansing. The statement also defended the military's operations as part of their "legitimate duty to restore stability", saying troops were under orders "to exercise all due restraint, and to take full measures to avoid collateral damage." The U.K. and Sweden requested the urgent UNSC meeting amid growing international concern over the ongoing violence. U.N. diplomats have said China, one of Myanmar's top trade partners, has been resisting involvement by the top U.N. council in addressing the crisis. The announcement came after the White House broke its silence on the clashes, saying it was "deeply troubled" by attacks by both sides, including the militant ambushes in Rakhine. The U.N. special rapporteur on human rights in Myanmar has said the latest violence may have left more than 1,000 dead, most of them Rohingya. Myanmar says the number of dead is around 430, claiming the majority of them "extremist terrorists." It says a further 30,000 ethnic Rakhine and Hindus have been displaced inside northern Rakhine, where aid programs have been severely curtailed due to the violence. The exodus of Rohingya, which so far tops 313,000 refugees, has saddled Bangladesh with its own humanitarian crisis, as aid workers scramble to provide food and shelter to a daily stream of bedraggled refugees. The U.N.-run refugee camps in its Cox's Bazar district were already packed with Rohingya who had fled from previous waves of persecution. Most of the new arrivals are in dire need of food, medical care and shelter after trekking for days through hills and jungles or braving dangerous boat journeys. Dhaka is providing them temporary shelter. 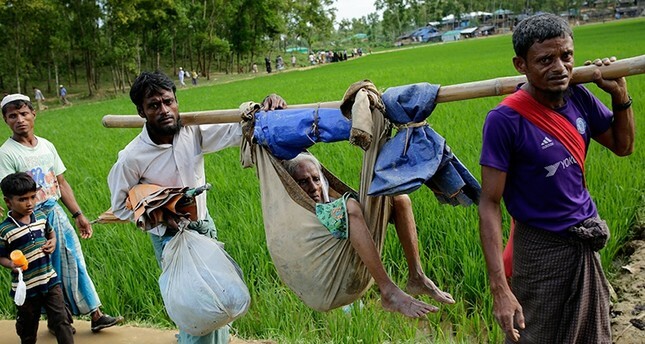 As the crisis broke out, Turkey called on Bangladesh to open its borders to Rohingyas fleeing violence, vowing to cover all the expenses associated with settling and aiding the Muslim minority refugees. After phone talks between President Recep Tayyip Erdoğan and Myanmar's State Counsellor Aung San Suu Kyi, Presidential Spokesperson Ibrahim Kalın announced that the Turkish Cooperation and Coordination Agency (TIKA) will be the first foreign body to provide aid to Rohingya Muslims in the Rakhine state. Last week, first lady Emine Erdoğan and her son Bilal Erdoğan joined Foreign Minister Mevlüt Çavuşoğlu, who was traveling to Bangladesh to personally deliver aid to Rohingya refugees. Turkey is also planning to build refugee camps for Rohingya Muslim refugees in Bangladesh, President Recep Tayyip Erdoğan said as the U.N. reported that the existing camps were "bursting at the seams." According to the president, present tent camps were "not very livable," and Turkey, using its experience settling millions of Syrian refugees in the country, was planning to build more secure and livable tent camps, if Bangladeshi authorities would allocate a special area for them. Meanwhile, Bangladesh Prime Minister Sheikh Hasina, who was due to visit a Rohingya camp Tuesday, stressed it was up to Myanmar to "resolve" the issue. "Rohingyas are Myanmar's citizens. Now they are snatching their citizenship away in phases and forcing them out of the country," she told lawmakers on Monday night, according to local outlet bdnews24.com. Earlier in the week Myanmar's army chief reiterated the stance of his powerful institution on the Rohingya question in a Facebook post, denying the group have ancestry inside Myanmar. Although many Rohingya have lived in Rakhine for generations, the 1.1-million strong minority was stripped of its citizenship in 1982 by a law that did not recognize the group as an official ethnicity. The Rohingya's failure to be "scrutinized" by this law is "the root cause of the current problem," the army chief's post said. "The term "Rohingya" was not present in the country's history," the post added, a refrain often trotted out by ethnic Rakhine and Buddhist nationalists who insist on calling the Rohingya "Bengalis" — or foreign interlopers. Hatred of the Muslim minority has swelled in recent years, with Buddhist hardliners fanning fears of an "Islamic takeover." The latest violence has tweaked religious tensions across the country, with different ethnic groups trading allegations of who is behind the atrocities. Dhaka, which has refused to permanently absorb the Rohingya, said it plans to build a huge new camp that will house a quarter of a million refugees. But it remains unclear if or when they will be able to return. Plumes of smoke continued to rise on the Myanmar side of the border this week despite the militants' announcement on Sunday of a unilateral ceasefire. There was no direct response from Myanmar's military, though government spokesman Zaw Htay tweeted: "We have no policy to negotiate with terrorists."